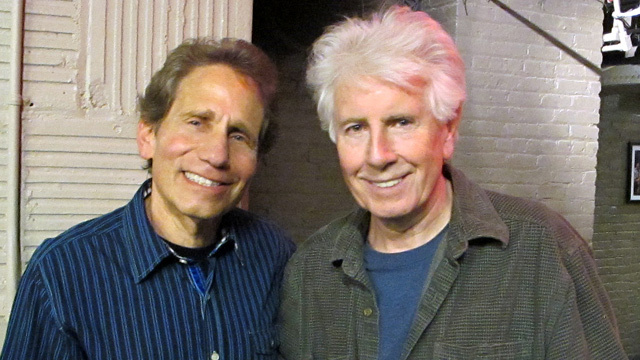 I had the pleasure of sitting down with Graham Nash this past summer, shortly after he had overseen the production and release of CSNY 1974 – a beautiful audio/visual collection capturing the band during one of their most memorable tours. He had also recently completed his fascinating autobiography, Wild Tales, chronicling his historic musical and personal journey. I didn’t realize that I was listening to Graham Nash when I first heard his voice coming out of my AM radio as part of The Hollies. It was the mid-1960s and his group was yet another one of those hit-making English bands that was part of the British Invasion. Their songs, including “Bus Stop,” “Look Through Any Window” and “On a Carousel,” stood out with their soaring harmonies and crisp production. However, just a few years later in 1969, I would become very familiar with Graham’s name as he joined David Crosby and Stephen Stills to create an amazing debut album—Crosby, Stills and Nash. Its unique sound divined from a magical blend of voices and a diverse collection of original songs helped to define the new FM radio sensibility and the beginnings of a musical genre. Graham and his mates were joined within a year by Neil Young and over the next forty years they would continue to perform, record, break up and reunite as a quartet, trio, duo, or solo act. Embracing political activism and making social commentary became an important part of their musical statement, but their songs never lost their universal appeal and timeless quality. Though each of the group’s members created a separate and strong individual profile, a CSNY identity remained and it was Graham that made sure they never drifted too far apart. There was a lot I wanted to talk about and Graham was happy to share some great stories with his usual enthusiasm and passion.